Nipped up the 3 Beinn a'Ghlo Munros on Saturday. Great day out! Couldn't have had better weather. Here are some photies.. Some phenomenal pictures there, particularly of the sunset. I totally agree with Fudge. Great photos - I'd love to see some words to accompany them though! Yes, a really great set of photos - I seen them before (on Flickr). David (who took them) used to be a member here which is why I know about his Flickr account. If you follow the link on the last photo there is a link there to the route taken. Basically we cycled the normal landrover track/walkers path NE along to Airgiod Bheinn. Then ascended it's very, very steep slopes with the bikes on our backs. Cycled along and up to Carn nan Gabhar. Left the bikes for the last 20m or so. From there it was an excellent, very fast, not-too-technical descent down to the bealach at NN958727. It was about 3pm and we were becoming conscious of the limited hours of sun remaining. So, we ramped up the pace and blasted up to the summit of Braigh Coire Chruinn-bhalgain with the bikes on our back. The second Munro of the day. The final ascent starts with a short section of bike-carrying, followed by a long, moderately steep cycle to the final summit - Carn Liath. By this time the sun was starting to set, casting a beautiful orange glow over everything. We spent some time at the summit soaking up it's rays, enjoying the atmosphere and posing for photies. The final descent was pretty wild. Probably the most technical thing I've ever ridden (Ben Lomond comes a close second). The walking/biking ratio was about 70/30 which is poor, but we expected that. Walking up mountains with a bike isn't too bad once you're used to it. My bike, plus water, clothing, spares, tools and other gear probably totals about 30kg. I'm sure many people carry more weight when camping. I wouldn't recommend anyone do this route on a bike unless you're very experienced walking with a bike on your back and at descending steep technical terrain. 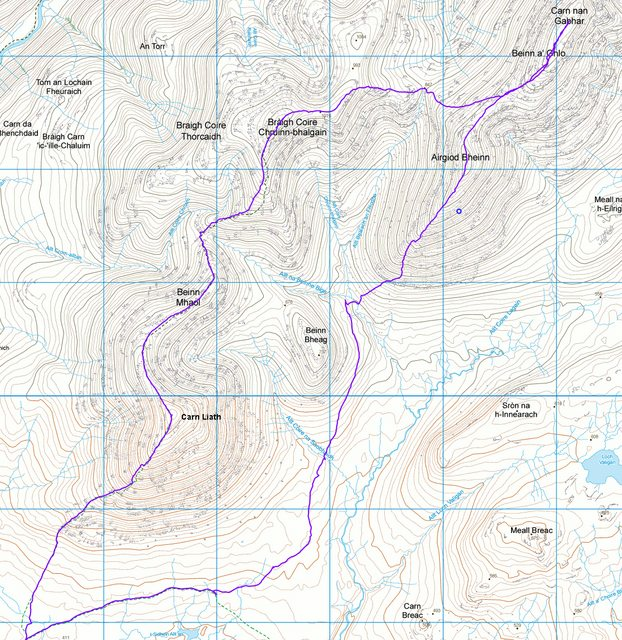 If anyone is interested in more bikey-Munro routes let me know and I'll post some. Some are 100% possible on a bike. A climb up to Mullach Clach a'Bhlair, then along to Sgor Gaoith before descending via Carn Ban Mor makes an excellent day out and isn't too technical. My bike, plus water, clothing, spares, tools and other gear probably totals about 30kg. I'm sure many people carry more weight when camping. That's quite a weight. I suspect most camping packs would be 15kg or so lighter than that ! Mine was 15 - 17kg and people thought that was heavy ! Thanks for the details DM. Way too technical (aka suicidal) for me too but I could be tempted to tackle Mullach Clach a'Bhlair, albeit with a bigger dinner plate on the back. Interesting you thought the walkers were unfriendly, folk normally aren't. If you think it's because you're a biker Here's an article you may like about the understanding and resolution of rural land use conflicts (bikers vs walkers). It's interesting and has both points of view.